For those with a penchant for hitting the waves, Mars was once a surfer's paradise. But where has the beach gone? A succession of probes to the "Red Planet" have confirmed that it was once a very wet place. Dried out sediments confirm that a massive ocean stretched across much of the planet's northern hemisphere. But where has the shoreline it once lapped against gone? With the eye of faith one can pick out on satellite images the faint outline of what might once have been the beach, but it is irregular, varies in height and is extremely indistinct and not present everywhere that it should be. Some scientists have speculated that the mass of the giant volcano on Mars, Olympus Mons, which is more than 20 kilometres high, may have gravitationally distorted or buckled the planet's surface. Even so, this still doesn't account entirely for the strange shoreline appearance. Now a team led by Alexis Rodriguez at the Planetary Science Institute in Tucson, Arizona, and publishing in Scientific Reports this week, have taken a closer look at the satellite surface data from Mars. Combining their observations with computer modelling, they theorise that the missing shoreline did once exist but was obliterated about 3.5 billion years ago by a sequence of massive tsunamis tens to hundreds of metres high. These were caused, they say, by two asteroid impacts of objects more than 30 kilometres across slamming into the Martian ocean. The first of the tsunamis thrust house-sized rocks and boulders as well as water and sediments up the shore for distances of over 500 kilometres. The water carried inland then carved characteristic "backwash" systems of canals and waterways, which are also still visible, through the newly-deposited debris. 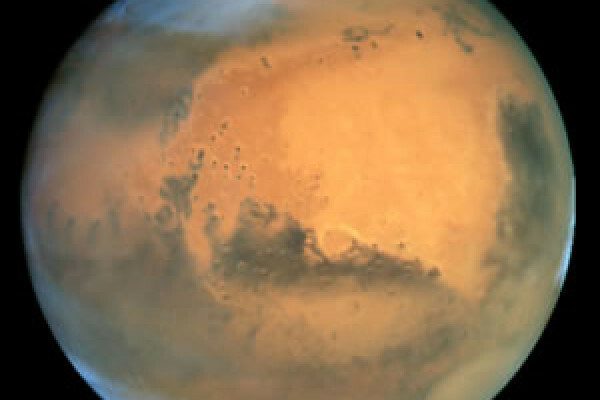 Next, millions of years passed during which Mars underwent a significant shift in climate, becoming colder and with a surface etched and scored by glaciers. This time, when the second asteroid impact occurred, the water was much colder and moved sluggishly inland and much of it froze in-situ before it had a chance to retreat, ccounting for the series of icy lobes of frozen debris still visible on the planet's surface today, 3 billion years later. Previous Has one in ten adults developed ADHD?